Nigeria is in equatorial West Africa and is Africa’s most populous nation. It has a southern coastline on the Gulf of Guinea and borders Benin, Cameroon, Chad and Niger. Nigerian history can be traced back to around 400 BC and nowadays there are over 250 different ethnic groups. 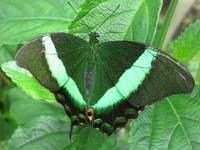 Nigeria also has a huge diversity of butterflies and movies – “Nollywood” produces about 200 movies per year.